Q-Connect Masking Tape 24mm x 50m (Pack of 12) KF01789 Pack of 12 Q-Connect Masking Tape. A crepe paper tape ideally suited to mask surfaces when painting or spraying. 24mmx50m. General Purpose 25mmx50m White Masking Tape (Pack of 9) 07517 Pack of 9 White masking tape for decoration and painting. Easy to remove. Leaves no unwanted marks. 25mm x 50m. Pack of 9 rolls. Scotch White 48mmx50m Masking Tape (Pack of 6) 201E48I Pack of 1 3M Scotch Masking Tape. 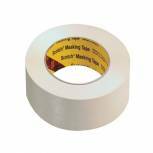 A general purpose masking tape with instant adhesion and good paint flaking resistance. Easy unwind and tear functionality. Latex saturated crepe backed. 48mm x 50 metres. 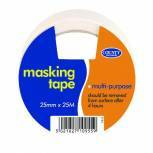 County Masking Tape (Pack of 12) C421 Pack of 1 County Masking Tape. 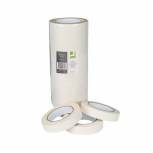 Multi purpose masking tape suitable for many applications. Size: 25mm x 25m.